Danny Lewis of smithsonian.com writes on how gay computer scientist, Alan Turing, saw the potential of his Turing machine for more than just computing, he managed to play music with it! Alan Turing is best-known as one of the world’s first computer scientists and the brains behind the effort to crack the German’s Enigma code during World War II, but his career didn’t end with the war. Not only did he continue to make strides in designing early computers, but he was also one of the first people to see their potential as musical instruments. Now, a group of researchers have uncovered and restored one of the earliest recordings made on Turing’s early synthesizer. 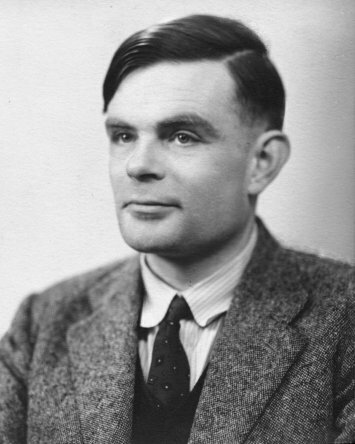 While working at the Computing Machine Laboratory in Manchester, England during the late 1940s, Turing figured out that he could make his enormous early computer produce identifiable musical notes by programming the CPU to play a clicking at certain intervals as it spun, Steve Dent reports for Engadget. These sounds were a far cry from anything 1970s synthesizer pioneer Robert Moog would create decades later, much less anything in modern electronic music. In fact, it wasn’t even really electronic music, as the notes were created by moving parts inside the computer. But the fact that Turing figured out that he could program the computer to create these tones was remarkable, the Agence France-Presse (AFP) reports. You can listen to the restored recording in full here.